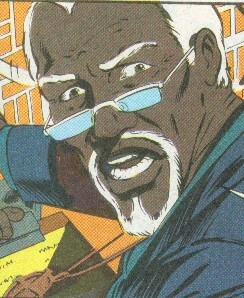 Powers/Abilities: Dr. Friday may or may not have truly had magical powers. He used a chemical, his Zhambi Concombre, which rendered those who drank it virtually mindless and susceptible to his commands. These beings were virtually living zombies, as they were resistant to physical pain and obeyed his orders without question. They could, however, be incapacitated by sufficient force. Friday claimed to have powers that allowed him to transcend death, and Brother Voodoo supported this claim, though he hasn't been seen since his death. (Moon Knight III#7 (fb) - BTS) - Dr. Friday recruited a number of followers who agreed to consume his Zhambi Concombre, becoming zhambi under his command under the promise that he would then restore them to normal and pay them heavily; Dr. Friday had no intention of fulfilling the second half of the bargain, instead intending to continue using each zhambi until they were killed in action. (Moon Knight III#7 (fb) - BTS) - Dr. Friday began moving his minions to Port-au-Prince to be loaded on to freight ships for export. (Moon Knight III#7 (fb)) - Hearing of the cult's plan, Brother Voodoo traveled to Port-au-Prince to foil it, but he was instead discovered by Friday's armed guards and brought before him. 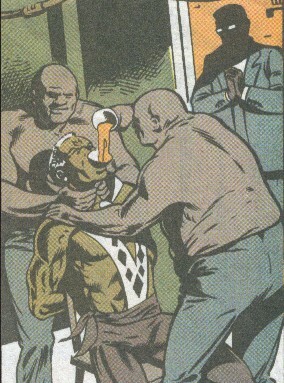 Friday had his servants force the Zhambi Concombre down Brother Voodoo's throat. 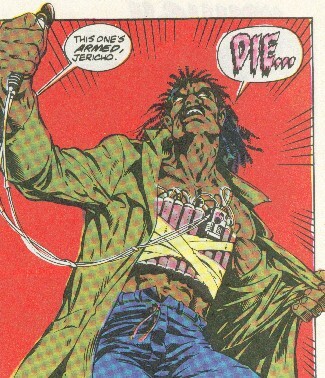 The drugs sapped his strength and stole his will, and Friday further stole Brother Voodoo's medallion, the focus of his voodoo powers and personal loas. The dazed Brother Voodoo was confined to the ship's hold with the other zhambi, and they were all transported to New York. (Moon Knight III#7 (fb) - BTS) - From a hounfour (voodoo base) in a slum in the south Bronx, Dr. Friday trained his zombies to hunt and kill their victims. (Moon Knight III#6 (fb) - BTS) - Seeking to eliminate his competitors but avoid the Kingpin's scrutiny, el Brutale hired Dr. Friday to send his zhambi forces to perform the tasks within a month's time. Armed with guns and bombs, the zhambi would kill the targets, then detonate the bomb, killing themselves and everyone else present, thus leaving no witnesses. (Moon Knight III#6 (fb) - BTS) - Aided by the spirit of his brother Daniel, Jericho was able to fight the drugs and escape the hounfour. He made his way to Spector Enterprises, Inc., seeking the aid of Moon Knight. (Moon Knight III#6) - While Brother Voodoo recruited aid from Moon Knight, Dr. Friday sent a zhambi to slay Tony Muscato and Gonzallo Vega while they were eating at the Gatti's restaurant. Brother Voodoo and Moon Knight arrived to stop the zhambi, and Moon Knight's unwanted sidekick, Midnight, arrived, swinging in and kicking the zhambi out the window just as it detonated its explosives. No one was badly injured except the zhambi, who was killed, and el Brutale was furious not only at the failure, but at how people on the street were now talking about the "dead" men taking out the heavy players. Dr. Friday tried to calm him, telling him he had plenty more "hitmen" to choose from, and that el Brutale's competition was as good as dead. (Moon Knight III#7) - Brother Voodoo directed Moon Knight and Midnight to Dr. Friday's hounfour, and the three of them invaded, fighting their way past the zhambi, though not without effort. Hearing the resultant gunfire, el Brutale became furious about the heat that was being brought down on him, and he shot Dr. Friday in the chest and fled. As he lay dying, Dr. Friday said that death was no barrier to him, and he gave a picture of el Brutale to one of his zhambi. Dr. Friday died shortly after the heroes confronted him, but his zhambi tracked el Brutale down, intending to slay him. Brother Voodoo said, "One such as Friday can reach from beyond the grave." Comments: Created by Chuck Dixon, Sal Velluto, and Mark Farmer. I'm sure zhambi is just another spelling for zombie, but these guys were called zhambi, and they weren't zombies, so I'm going with it here. Gatti's --> John Gotti...real word mafia. His real name and Brutale's first name were revealed in Midnight's profile in OHOTMU A-Z HC#7. Tavio Brutale was a mobster seeking to eliminate his competitors but avoid the Kingpin's scrutiny, Brutale hired Dr. Friday to send his zhambi forces to perform the tasks within a month's time. However, when Brother Voodoo and Moon Knight became involved, the zhambi met with failure, drawing attention to Brutale's operations. By the time the heroes stormed Friday's base, Brutale had become furious, and he slew Dr. Friday, terminating their agreement. Before dying, however, Dr. Friday sent one of his zhambi to kill him. While Brutale began making new plans, the zhambi was approaching him without his knowledge. His last name was probably Brutale, as some of his men called him Senor Brutale, but el Brutale is how he was first addressed. Willing agents of Dr. Friday, who drank his zhambi concombre, becoming zhambi under his command with the promise that he would then restore them to normal and pay them heavily; Dr. Friday had no intention of fulfilling the second half of the bargain, instead intending to continue using each zhambi until they were killed in action. Friday trained the zhambi to kill people of whom he gave the zhambi pictures. Armed with guns and bombs, the zhambi would kill the targets, then detonate the bomb, killing themselves and everyone else present, thus leaving no witnesses. These beings were virtually living zombies, nearly mindless and susceptible to his commands, and they were resistant to physical pain and obeyed his orders without question. They could, however, be incapacitated by sufficient force.